We offer a wide gamut of FEP Heat Shrink Tubes that is fabricated using high quality material and appreciated for durability. These FEP Heat Shrink Tubes are widely applied in office machinery, paper machinery, printing machinery, printing presses, insulated jacket, etc. These FEP Heat Shrink Tubes are the main insulation of rotor of the electric instrument, use in water treatment, makes the magma sample in the field of oil field, etc. 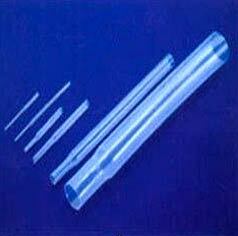 These FEP Heat Shrink Tubes are also used for UV lamp protecting and for packing anti-corrosive things.